I’m an enthusiastic gardener, but I’m not all that adventurous. I tend to stick to plants I know will thrive and plant the same thing in a couple of different gardens if I like it. I’m also quite Darwinian in my gardening. New seedlings and plants I’ll try to water daily (when I remember) but after the first year – if it can’t survive without me fussing over it, it’s not going to survive in my garden. I love pretty flowers but I don’t like planting them so aside from a hanging basket or two and some vegetables in planters on the deck, annual plants are out. I much prefer perennials as far as flowers go. 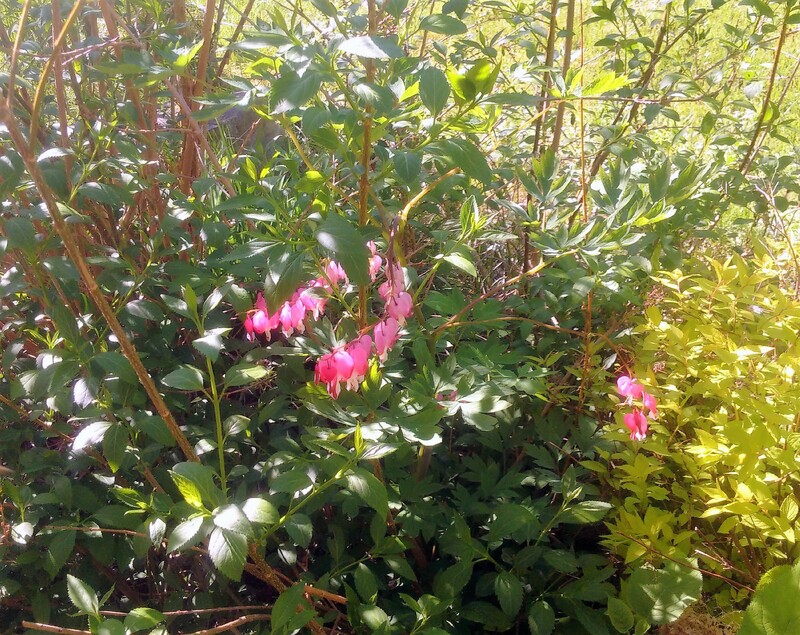 This Bleeding Heart Plant comes back every year – even when animals eat the flowers! 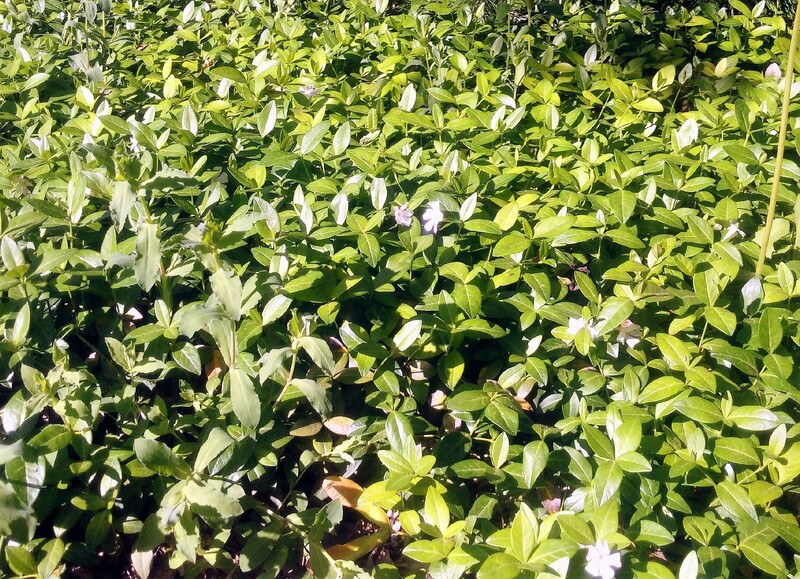 Another thing I have a lot of in my garden is groundcover. There are a few gardens that just don’t get the attention they should and a good thick carpet of periwinkle means that I’m not always pulling weeds in those gardens which makes my life a lot easier on the gardening front. Plus I’ve managed to somehow have both white and purple flowers in the same garden and I’m kind of in love with the white ones. I love the carpet of periwinkle in the one back garden. Mostly white flowers here with a sprinkling of purple. My mum and I shared a love of wildflowers, and the gardens in the front are a testament to that love. We have wild phlox beginning to flower (it’s in the not so pretty pre-flowering stage where I have to remind myself that it’s tall and awkward right now but it’s not a weed so I need to leave it where it is) in 2 or 3 different gardens. There are also a ton of tiger lilies that we brought from our old house when we moved here 15 years ago. Those plants were brought to that house from the side of the road where mum and a friend dug up a few and they spread quite well. Around here tiger lilies are also known as ditch lilies because they grow by the roadside. Right now they’re just a mass of green foliage but later in the summer there will be gorgeous orange blooms and the best part is they’re less lily-like than most so I don’t sneeze every time I go by them. Then there are the trilliums we rescued from behind the hydro shed up the road about a decade ago. They were doing some construction and mum stopped and asked the workers what they were doing with the trilliums – and the worker just shrugged and said ‘composting’. We asked if we could transplant some and they said sure just do it by the following week. We both knew that trilliums don’t transplant particularly well from the wild but figured it was worth a shot. 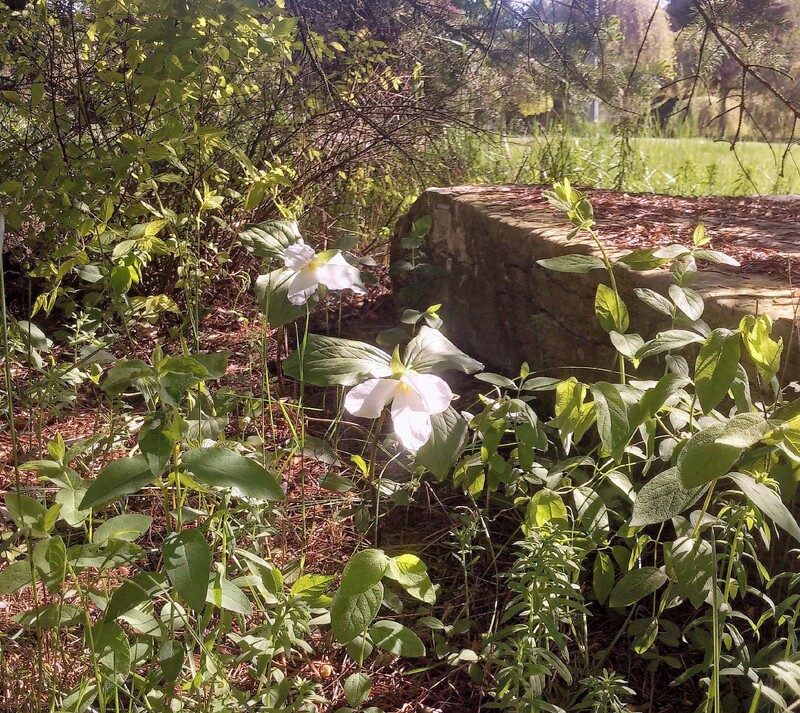 We dug up about 10 trilliums along with some of the soil around them and planted them in similar conditions (under trees and other shady spots in well drained soil) in our gardens in twos and threes. 8 of them took and we now have gorgeous trilliums coming up every year. I can’t help but think of mum every time I look in the garden and see them. Two of the trilliums in the gardens – there are a couple of deep red ones too but they’re earlier to bloom and I missed them. 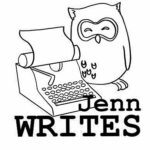 All this time spent in the garden made it easy to choose my word for Word Wednesday (even if it’s not going to get published until Thursday because life happened). I am often asked what a perennial plant is when I’m talking about my garden. A perennial plant is one that comes back every year and often one that flowers throughout the growing season. So hostas, periwinkle, bleeding hearts, and trilliums are perennials since they show up every year and don’t need much other than dead-heading and occasional dividing. The periwinkle leaves are around all year but the hostas disappear in late fall as do the trilliums and bleeding hearts only to reappear the following spring. Perennial plants are different from annual plants that only live one or at most two years (depending where you live some plants are annuals vs perennials because they don’t overwinter well). Yes annuals are pretty – I love geraniums in planters but I hate planting them every year so I admire them in the gardens of my friends and in the hanging baskets around town. The word perennial comes from the Latin root per (through) and annus (year). 1.Lasting or existing for a long or apparently infinite time; enduring or continually recurring. I love your yard. It is very beautiful. I also love that you have lots of perennials. It’s a very good choice! Nature appreciates a well placed and protected perennial. The Trilliums! I think they are so amazing. I lived in Ottawa for quite some time and I never once saw one in nature. Yes. Really. It wasn’t for lack of trying! It’s a beautiful tribute to your mother, Jenn. Lovely. I really love this week’s word.